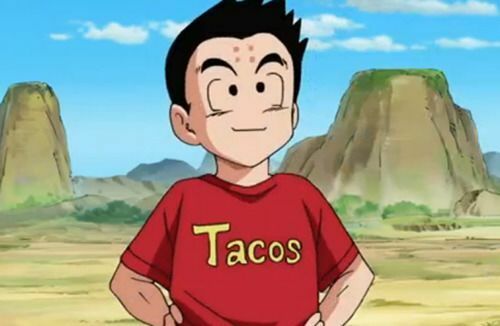 What does it mean the “Tacos” t-shirt of Krilin? In Dragon Ball Super Krilin uses a t-shirt with a "Tacos" inscription. What does it mean? It's the mexican Tacos food, or is it the japanese "Takos" (which I guess it could also be written tacos which means octopuses which are eaten in Japan) or is it something else? It refers to the Japanese word Tako, ie "Octopus". This word is also a cheeky way of referring to someone's baldness (Example: Tatsumaki uses this word to insult Saitama in One Punch Man(Where the Main character's baldness is a recurring joke)). Krillin's baldness has been made fun of in the show. So this could possibly be a reason for the same. The Mexican dub of Dragon Ball Z was very popular and considered to be one of the best. So perhaps it could be Toei acknowledging them as a fanbase considering they chose "Tacos" in specific when they could've possibly put anything else on his shirt. Perhaps we are thinking too much of it. Just like in countries like the U.S where we see T-shirts with random Japanese Kanji on it, T-Shirts with random English words are indeed popular in Japan. So it was probably randomly chosen. Personally, I would like to think they gave it some thought and it was perhaps chosen on account of the first reason. However, it could very likely be for absolutely no reason at all and something only the artists know. Not the answer you're looking for? Browse other questions tagged dragon-ball-series dragon-ball-super japanese-language or ask your own question. Do the events of the Dragon Ball movies happen to some extent in the series?